Rather than create a mere memento of the boxing season gone by, we’ve tried to do something a little different with this year’s 180 page Annual. Ever wondered what Anthony Joshua really thinks of Tyson Fury? Or what Ricky Hatton remembers about partying with Oasis? Do you want to know what Carl Frampton really thinks of Eddie Hearn? Or what went through Sugar Ray Leonard’s mind when he got into the ring and sparred Roy Jones Jnr? 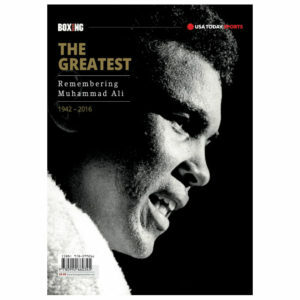 Additionally we explore and explode 15 myths surrounding the life and career of Muhammad Ali, go in-depth with Floyd Mayweather, Canelo Alvarez, and Manny Pacquiao, deliver an incredible and exclusive glimpse from the changing rooms of the biggest fight of the year, hear Nick Blackwell’s harrowing hospital memories, and provide a wealth of never-before-told tales from past and present.